And there are probably more threads about this. However there seems to be another problem now with the headers from mails send to one's gmail address. I will include an example header, hope someone finds a problem that can be solved; The purple lines i have removed like i did before, however removing these lines alone is not working anymore, so there has to be something else wrong in the header. I also tried removing both the purple & orange lines as to me they show similarity in context, but this still gave the same reporting error. Subject: You sent me photos ? Please stop sending me your pictures. if you could provide the tracking URL (like the one I provided above) it would be easier to see the problem. (removed spaced lines from headers and added X- to Received: line. 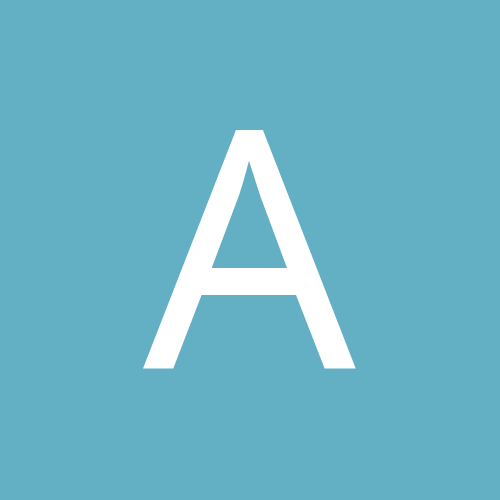 See comment in parse of test link). I did some testing after your reply. I tried removing my Mailhost config, but that didn't work. So after doing Mailhost config again it suddenly worked again. I do inde manually report on the website by pasting my spamsource & then removing Google's internal IPv6. Don't expect Google to bring a solution, Google seems to dislike if not hate spamcop & certainly isn't interested in providing support to spamcop users. Can you suggest me another lasting & trustworthy free email address supplier which will not try to irritate spamcop users ? So after doing Mailhost config again it suddenly worked again. The problem I see with IPv6 is for it to do away with NAT, it has opened up for hundreds of internal networks. SpamCop seems to remember only a select set of IP addresses with mailhosts. This means that there could be 2^72 hosts hiding behind a network. When some people scale up their data centers, they just add more servers instead of fixing the quality of the servers. Like albert2, the workaround was fine until a few weeks ago (removing the "Received: by..." line(s) from the original full header and spam body, then pasting it into the comments section before hitting the "Process spam" button). I used to do this by simply copying the full header and spam body into Apple's TextEdit program as a plain text file, making the edit, then pasting into SC's report spam form. Hope I'm describing this clearly. Again, it worked fine for several months. But now I see what I was seeing before when SC parses the header. Screen shot attached. My mailhost configuration appears to be correct. It probably doesn't matter, but the only other change I made on my end was upgrading from macOS 10.13.4 to macOS Mojave 10.14.2 (latest build). I'm following this thread in hopes to find a workaround that works again. Thanks in advance for any tips that help me report spam forwarded from my Gmail account. Google seems unwilling or unable to make things simple and clean. Sigh. If it's helpful, here's the tracking URL generated by SC when I attempted to report the latest Gmail spam. Thanks again and happy 2019: A new year full of hope and promise — and free from spam. f it's helpful, here's the tracking URL generated by SC when I attempted to report the latest Gmail spam. Thanks petzl, but that didn't work on my end. No joy. After removing the line you suggested, I still see the "nothing to do" message when trying to report Gmail spam. Good news today: The mail host for my "real" address lets me block entire domains. Google does not. 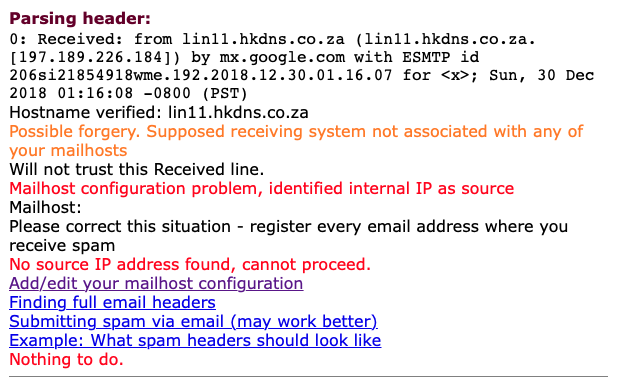 I blocked all incoming mail with anything that includes @hetzner.co.za ... clearly an evil or compromised rogue domain. That won't completely stop the Gmail garbage, but it's a start. The Internet is easily the most important advance in human communication since the invention of the printing press (around the year 1440 CE). Unfortunately, the 'net is now highjacked by the worst aspect of human nature: Unbridled greed. Thanks for your tip; I'll keep an eye on this thread for more news and possible solutions. My ISP/primary email provider has a similar option available, which can be useful. One thing to watch, however, is that sometimes there are limits to how many domains that are blocked. Thanks, lisati. Good info. FYI: My primary email provider (Hostbaby) places no limit on how many domains I can block. Is this a great world, or what? Happy new year to all SpamCop members and users... a new year full of hope and promise (and free from spam). may interest you, although, now you've blocked it (good work!) you may not care.